I recently had the pleasure of sitting down with a transplant motorcyclist with a beautiful bike, and a great sense of humor. 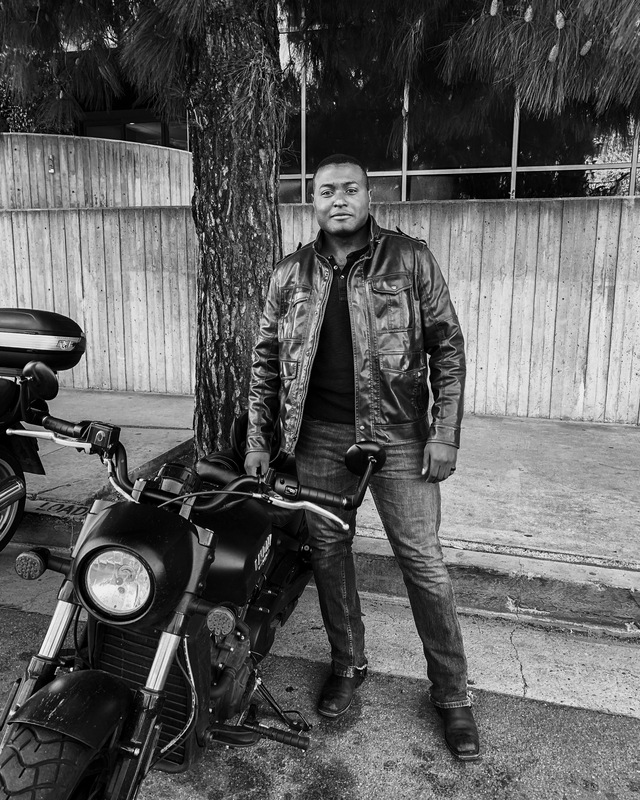 Vincent Perry is an aspiring actor, and a die hard Indian motorcycle enthusiast. Throughout our interview we laughed, talked bikes, the LA riding experience, and the importance of motorcycle friendships. We’ll start in the beginning of his motorcycle journey and find out more about Vincent. V: I been riding since early January of this year. T: Is that when you took a riding class? Or when you learned to ride? V: I was living out in North Carolina, and a buddy of mine was like, “hey I have this bike.” My response was, “cool.” I hopped on and I could never get enough. That’s what sparked it. I went up and down roads all day on that bike. T: What kind of bike did he have? V: It was a sport bike. I’m still new, so I’m not sure what type of bike. But I know it was a Yamaha. T: It’s interesting that it was a sport bike but you didn’t end up buying a sport bike. V: No, the way they accelerate, and how fast they can get up speed, it just felt like too much. I knew I liked the experience of riding, but I don’t want to go that fast. So, that’s when I settled for the cruiser. T: Do you also have a car? T: Your friend taught you how to ride? You haven’t taken a safety course? V: No, I haven’t taken a course or anything. T: Do you think you will? V: Maybe in the future if I can get some time off – living out here in LA is crazy! T: I know they offer classes on the weekend. V: That’s good info to have, a weekend would make it a lot easier. T: What kind of bike did you end up buying? V: I ended up getting an 2019 Indian Scout Bomber. T: Had you researched that bike before hand? Or did you go into the dealership see it and that was a wrap? V: Yes, I completely researched this bike. I was looking at what types of bikes were out there. Like everyone else, the first cruisers I looked at were Harley’s. I could never settle on one though. Then I hear about this Indian brand; I’d never heard of it. I started doing my research, and I learned they were one of Harley’s biggest competitors back in the day. Then they sort of went under, but recently they started back up, and they were bought out by Polaris in 2014. Then, I started looking at their styles of bikes and I thought they looked way better. As far as the bodies go they’re definitely better than Harley’s in my opinion. T: You didn’t want to buy used first? V: No. Go big or go home! V: That’s how I live my life. I hope you enjoyed the first part of my sit down with Vincent. Make sure to keep an eye out for part two.